Personal Economic Model® 2 Ways to Help You Your Circle of Wealth Retirement Ready or Not? We believe there is more opportunity to serve our clients by helping them avoid the losses. We have the best job in the world! For over 20 years, George Financial has helped many individuals and their families be more efficient with their money. We focus on helping you find areas where you could be transferring dollars away unknowingly and unnecessarily and redirect these dollars back into your future. The Personal Economic Model®… What is it? 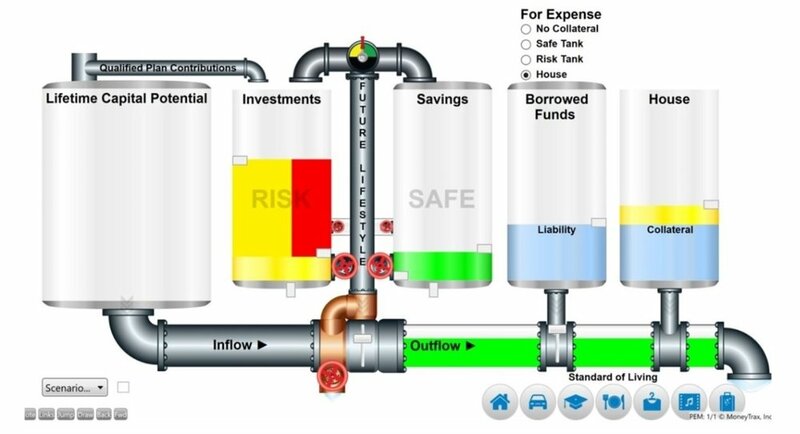 The Personal Economic Model® is a cash flow diagram that we use to help communicate how money works and how money flows. Throughout your financial life, you will make many important financial decisions. Money works best when in balance, but it can be difficult to find and maintain this balance. The 4 Most Important Financial Questions? How much do you need to save on a monthly or annual basis to be able to retire at your current standard of living and your money last until life expectancy? Doing what you are currently doing, how long will you have to work to be able to retire and live your current lifestyle until life expectancy?